This is said by God, or if you wish, the way God chooses to present God’s self to the main character in the story. And it is directed at the main character who is having dinner with the Trinity. Yup…that’s right…the Father, Son, and Holy Spirit. To get a real grasp of the power of these words, you might need to read the book. And it might not hit you the ay it did me, but I was moved. Something deep in me shifted when I read those words. In a world of “shoulds” and “musts” that are crammed down our throats from infancy, God would not have us be slaves to the “shoulds” and “musts.” There is no formula for a relationship with God. There is no secret handshake, special prayer, or required reading. While the reading and praying will undoubtedly will help us get to know God, that’s not the substance of our relationship to God. So while I love tradition and appreciate those who encourage me to be disciplined in my efforts to seek God, I was reminded in this book that “this’ does not equal “that.” Bible study, prayer, church attendance, ministry service, fill-in-the-blank-here, does not equal relationship with God. May I always seek to understand the underlying meaning of the traditions in the body of Christ and never forget they are only a very small part of what God wants from me: my heart. I learned about this book while reading my latest issue of Relevant magazine. I decided to buy a copy because I have become more politically and socially aware in the last year of my life. 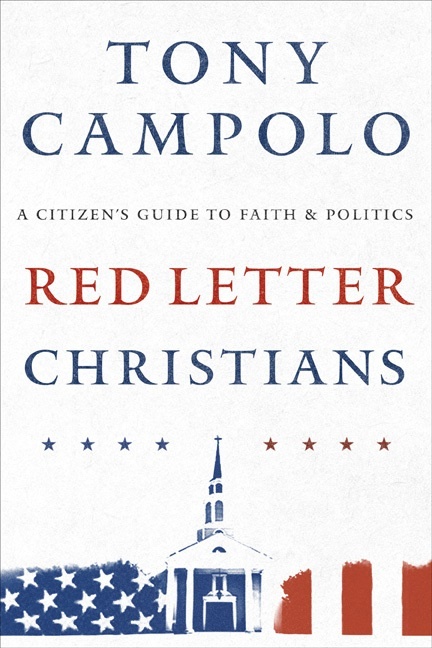 The subtitle of this book is “A Citizens Guide to Faith & Politics” and I can definitely say I think Tony Campolo did a great job in holding true to that. While he is up front about his political leanings and adamant about certain issues, he seems to do a pretty good job of helping his reader understand both sides of the issue. I must admit that the quote from President Clinton on the top front of the cover kinda threw me for a loop. But it forced me to own up to my judgemental attitude towards a man who, despite his moral failings, has probably done more positive things than he is often given credit for. Tony addresses a wide variety of issues in this 224 page book and it could be aptly viewed as a primer for present day politics in America. After a short intro citing increased reticence in a majority of Christians to label themselves as “Evangelicals” along with a straying from the recorded words of Jesus himself as the reasoning for the creation of the term “Red Letter Christians,” Tony spends time on Global Issues. Covering issues such as the environment, the war, and the AIDS pandemic, he highlights the important part America plays in the globalized community that is now our reality. It is interesting to me that he chooses to put these chapters first in his book. Based on his writing, I think it is safe to say he did that intentionally to help his readers widen their perspective on what is important. Next Tony tackles the Hot-button Issues that for some are the single most important issues of any election: gay rights, abortion, and increasingly, immigration before covering Economic Issues and Government Issues. Here he covered issues such as minimum wage, wasteful government, and political lobbyists. As a passionate person, I tend to get riled up when these issues are discussed. That said, I didn’t read this book to illicit feelings. I read this book to be a little bit more informed about the issues at hand. Tony did not let me down on that. I appreciated his even handed approach to the issues especially since he did not come across as dispassionate or disinterested. I recommend this book to anyone who has a growing desire to understand more about the political arena in America today from a faith based stand point. I started reading Jesus for President, by Shane Claiborne and Chris Haw, quite a while ago. Aside from the fact that I have had quite a bit going on in life lately, it was a slow started for me. The end, however, is a different story. Altogheter I am not sure what I think about many of the ideas Shane and Chris present in this book. But that is in all actuality a good thing. In the past year, I have gone through a HUGE paradigm shift and there are quite a few things that are up in the air. But this book touched on some sensitive issues for me. See, I served for 4 years in the Navy. Honestly I didn’t know enough about politics to decide whether or not we should have been in Iraq, but just like a young child doesn’t often question the goodness of where their parents are leading them, I hung onto the ideas of fighting for freedom and liberating people from tyranical governments. And so just like when a child realizes for the first time that their parents are not perfect, it is heartbreaking to me that I now feel as though I have contributed to something so awful because I relied on Uncle Sam to steer a true course. But that’s the problem, now isn’t it? Uncle Sam can’t steer a true course. I guess what is most disheartening is that I bought into the lies. But then again, how is a new believer who converted at the age of 14 after being brought up in an agnostic home supposed to know save for the teaching of the church? Shane said in his book that there was only one denomination that endorsed the war: Southern Baptists. And so as Shane points out, I combined the church and the government. Or tried to since that is an impossibility. And so I am at an impass. Things that I can say for sure: I am no longer deluded by the beauty of the united states. I do not deny it’s beauty, but I will not bow to it any longer. I confess now to all those interested that my patriotism had passed into the realm of idolatry and my trust was in the united states of america instead of the unity of the Triune God. I am not sure which way to go on other issues. But I am not anxious to make that decision. I am very interested in starting to sort it all out though. Paccifism is truly mind boggling to me and yet this book put flesh on the idea that is helping me understand. And I admit that I kinda want to believe that is the way. But I’m not there yet. It kinda feels like a part of me is dying. But it’s not dead yet. I am trying not to fight it, but it breaks my heart that I was (and technically still am since they won’t take their claws out of me just yet) a part of a war machine. I am thankful, oh so thankful, that I did not directly participate in the war. While this does not nullify the part I did play, it is a little less overwhelming to me. I don’t know if I could withstand the emotions I am experiencing only amplified many, many times. The story Shane tells of the soldier who killed the old man and his son comes to mind. I cannot imagine what that young man is feeling. The parallels drawn between the united states and rome. Economy: “to be uninterested in economy is to be uninterested in the practice of religion; it is to be uninterested in culture and in character” (p. 191). In Appendix 3, I really got a lot out of the contextualization of Romans 13. That is a passage that I have heard many times before, but I unfortunately never took the time to look into why people interpretted in the way they did. But then again, questions were viewed as doubt which in that world were not aceptable. Plus the alternative was not pretty. It meant swallowing my pride and admitting that I could possibly be wrong. I would like to write more but I am somewhat distracted because I am at my mom’s house and I haven’t really had the time to process through all of this. For those of you who have read this book or heard Shane speak, I would love to hear your thoughts.